Flash RAM is a handy tool in the ColdBox Framework that can easily be used to temporarily store the RC (request collection) data forward one request. As I was using the Flash RAM feature recently, I ran into trouble while attempting to persist the form data back to the original form when a validation error had occurred. Thanks to everyone who came out to my presentation today on How To Be a Good Open Source Citizen. I hope you learned a ton and are excited to start moving from a consumer to a contributor. I, as a good citizen in training, have my slide deck out on GitHub. Ortus Solutions and Computer Know How are co-sponsoring our first ever *BOX Party Hackathon at this year's CFObjective 2013. We will be hacking and parting it up at the FireLake Grill in the conference hotel. We will be holding a mini-Hackathon with some great prizes given out at the end including some throw back 80's prizes and some cool Nerf prizes. Even if you aren't into ColdBox yet, drop by and hang out. WHERE: FireLake Grill House & Cocktail Bar inside the Radisson Blu Hotel. Head to the back, you'll find us!! 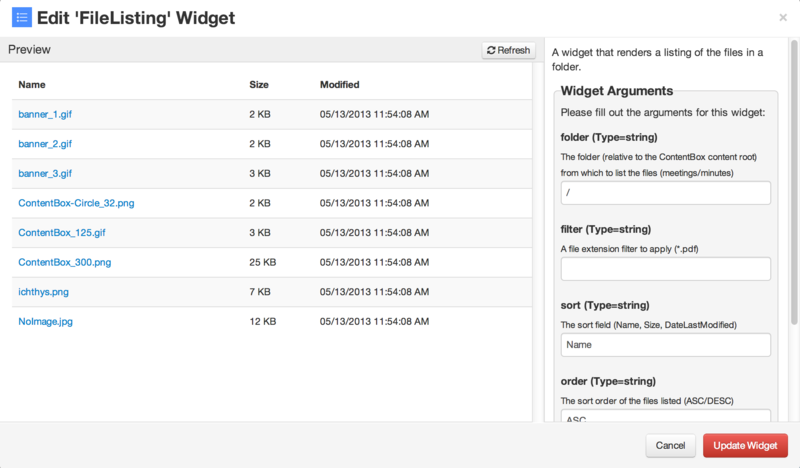 We have created a new widget for you to use to list files under the ContentBox media root called "File Listing". Imagine if you needed to list all the pdf's in a folder, this would be the widget for you. The ContentBox FormBuilder module has now been updated a great deal from its original 0.1 initial release to version 1.0. The new version fixes a significant number of bugs as well as adds reCAPTCHA and style/container hooks to the settings screen. So what is FormBuilder? FormBuilder is a ContentBox Module that will enable form building capabilities in your applications. You can select from text, textarea, dropdown, checkbox, radio, etc.